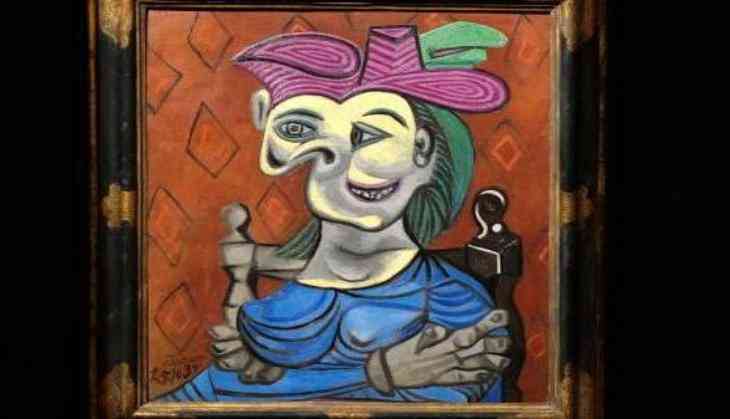 "Femme assise, robe bleu," a painting by famed painting Pablo Picasso has been auctioned in New York for USD 45 million. The painting, which dates back to 1939, was confiscated by the Nazis when they occupied France in 1940. The painting depicts Dora Maar, one of Picasso's lovers. Picasso's paintings have sold for substantial amounts- Les femmes d'Alger (Version 'O')" sold for USD 179 million, setting a record price for an artwork, and in 2004, "Garçon a la pipe" (1905) sold for USD 104 million. "Femme assise" (1909), one of Picasso's earliest Cubist paintings, sold for USD 63.4 million, while "Femme assise, robe bleu" was last put on sale in 2011, and sold for USD 26 million.